I was in Boston recently. 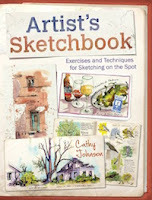 There's so much to see there, I didn't really have any time to paint or sketch. I didn't even visit any art museums; however, always vigilant about noticing art-related stuff, I snapped photos of several things that caught my interest. 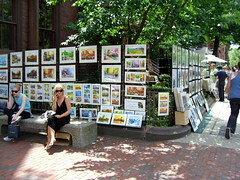 I spotted this display of watercolor prints for sale at the corner of Dartmouth and Newbury Streets. The artist, Charlie Wang, paints watercolor landscapes of various points of interest in Boston, such as Fenway Park, Boston Common, cityscapes, etc. 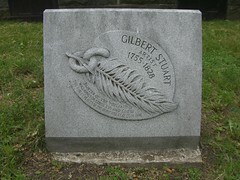 I saw this headstone for Gilbert Stuart while walking in Boston Common. The headstone reads, "Painter of the portrait of Washington, Louis XVI and Geo. III. This tablet was placed by the Paint and Clay Club 1897" Stuart's unfinished 1796 painting of George Washington, also known as "The Athenaeum," is his most celebrated and famous work, and is the basis for the image of George Washington on the U.S. one-dollar bill. 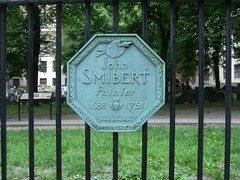 This marker for John Smibert was attached to a fence around Old Granary Burying Ground near Boston Common along the Freedom Trail (John Hancock and Paul Revere are buried in this cemetery). 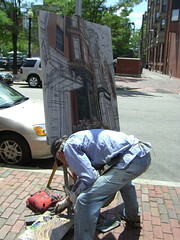 Smibert was a colonial painter and served as the architect for historic Faneuil Hall in Boston.